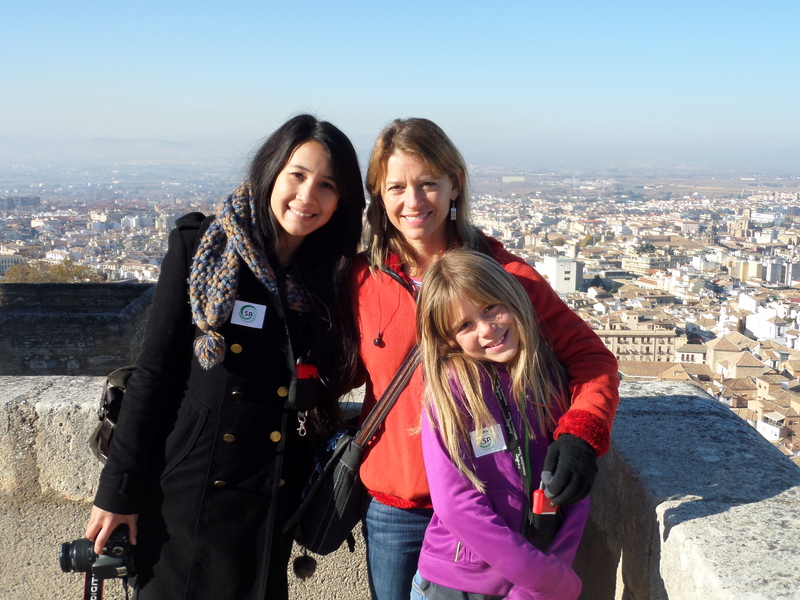 November 2013 Team Kezmoh goes to Granada and picks up our second visitor! 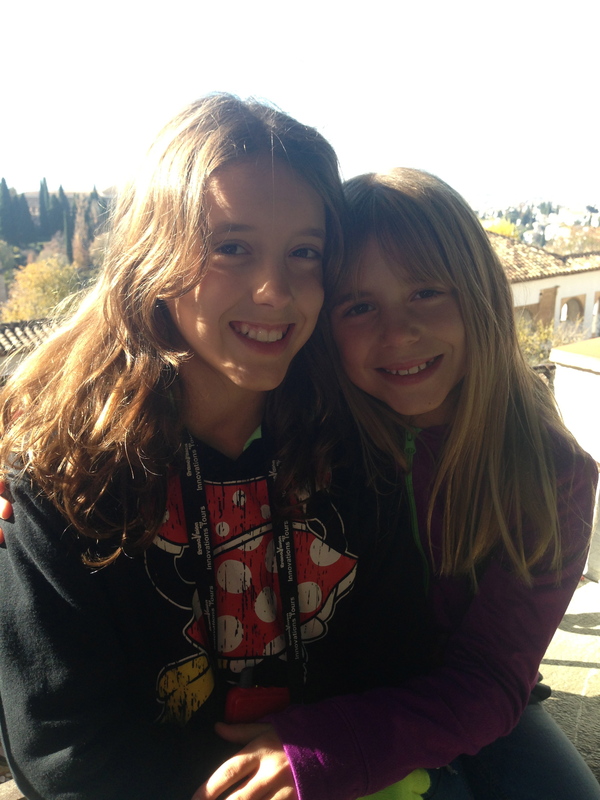 Our friend Carolina arrived on the train in Granada. 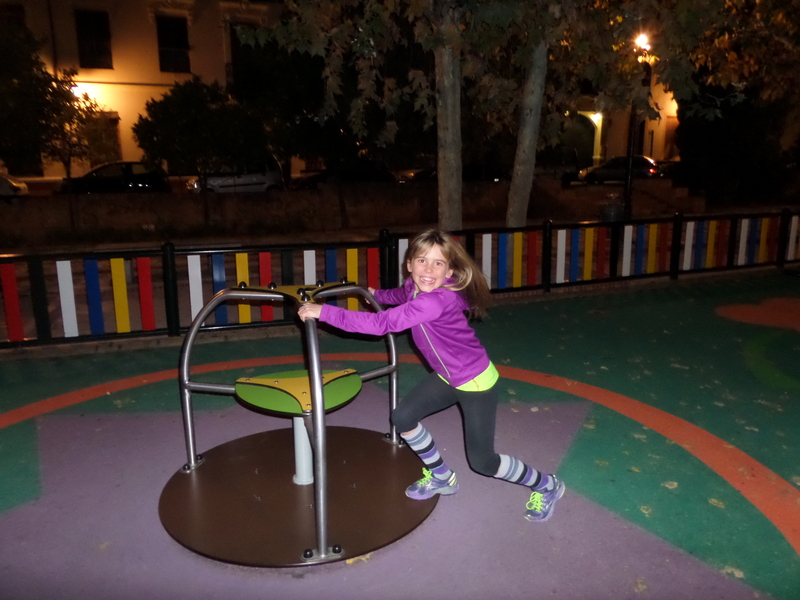 You may recall from previous posts that Carolina is the young woman from Sevilla, una sevillana, who came to stay with us in California last summer. 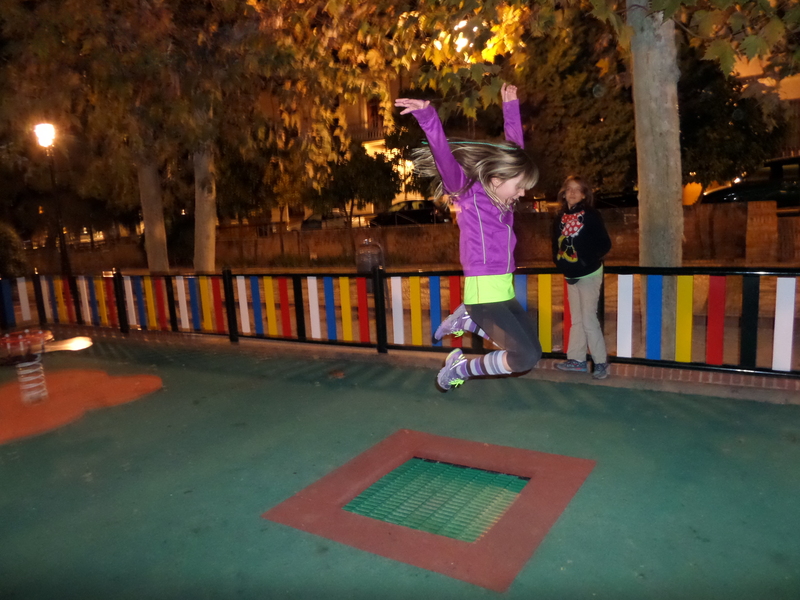 In November she was on break from the Universidad de Sevilla where she is studying education. After her stay with us last summer Carolina became part of our family so we were very excited that she made the 3 hour train trip to visit us. We picked her up at the train station in Granada. There seems to be endless construction in the center of town so we drove in circles until we were all dizzy. We finally parked the car and walked to the train station. Lovely Caro was waiting for us on the steps. The girls ran to hug her, happy to see her smiling face. From the train station we walked to the Plaza de los Toros where we had lunch at El Coso which is a lovely place located literally under the bleachers of the bull-fighting stadium. We are not fans of bull-fighting so this was as close as we will make it to a bull fight. 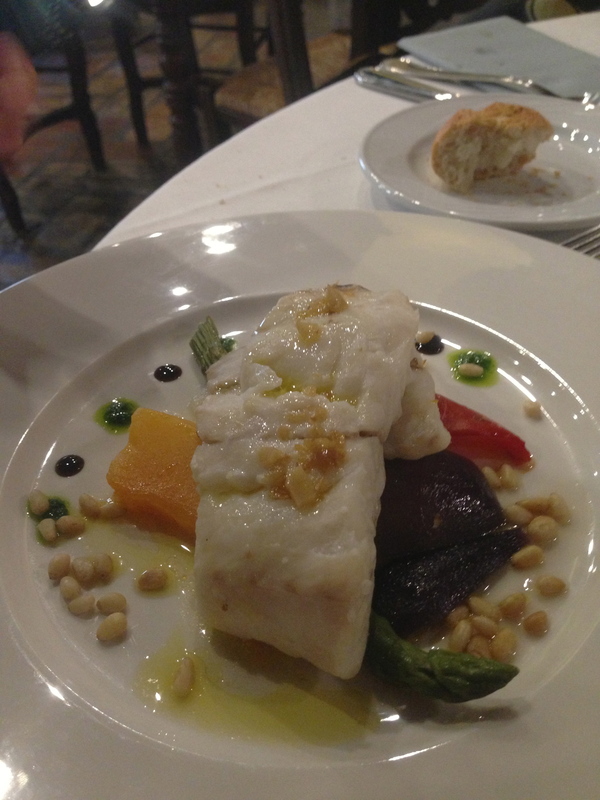 The service and the food were exceptional. 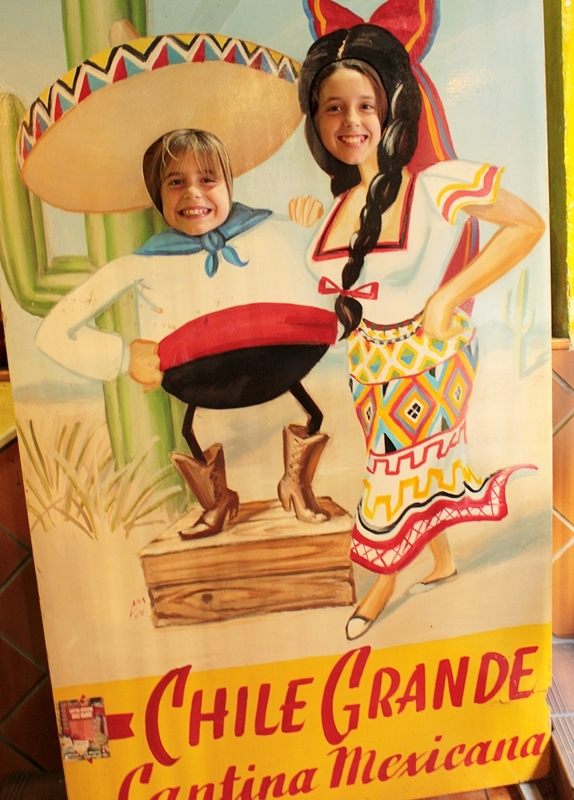 Our waiter was really funny and left a lasting impression with the girls. 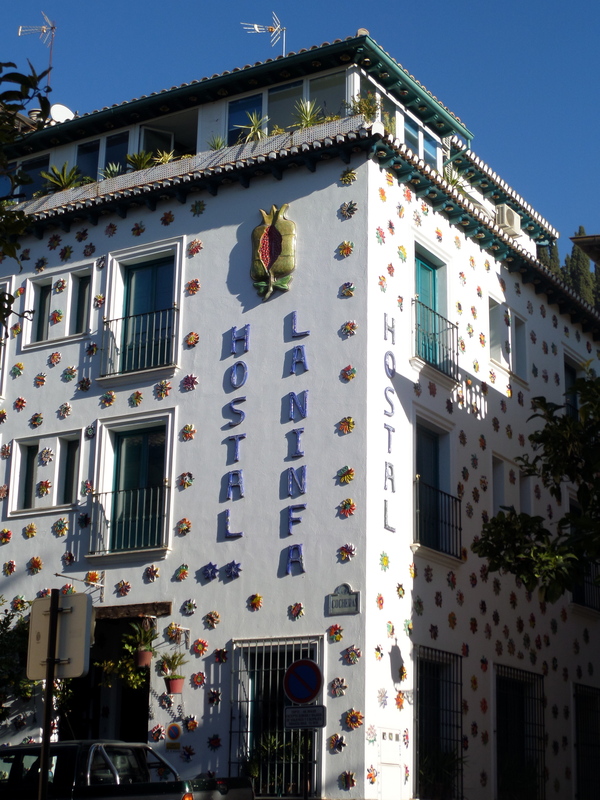 After lunch we snaked up switch-backs to our hotel, La Hostel Ninfa in the Realejo neighborhood of Granada. I chose the hotel for it’s proximity to the Alhambra and the cool pictures of the facade on the internet. It was not easy to find but using the GPS we managed. It is owned by a German woman and her Moroccan husband who is an artist. 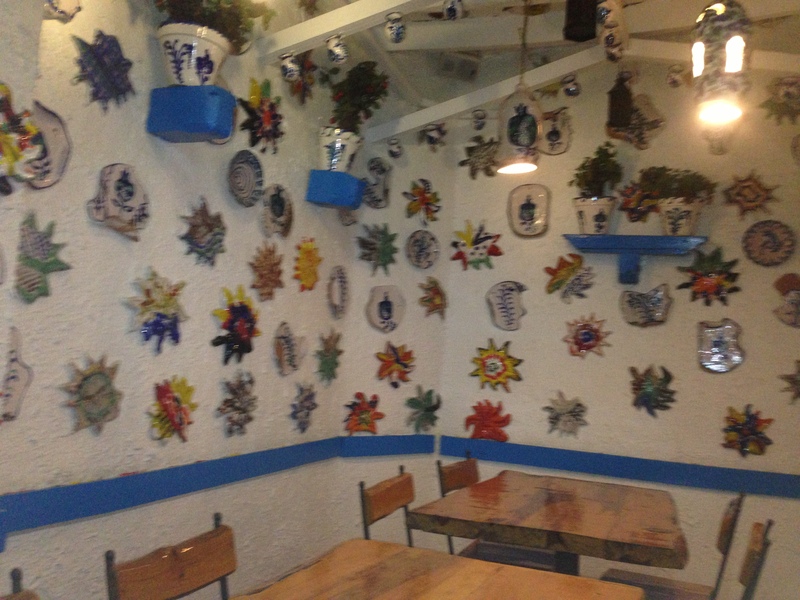 It is decorated inside and out with painted ceramic plates and stars. We had a lovely view of the sunset when we arrived. That night we paid the price in sleep deprivation for being close to tourist sights and restaurants with noisy people and cars in the streets below. 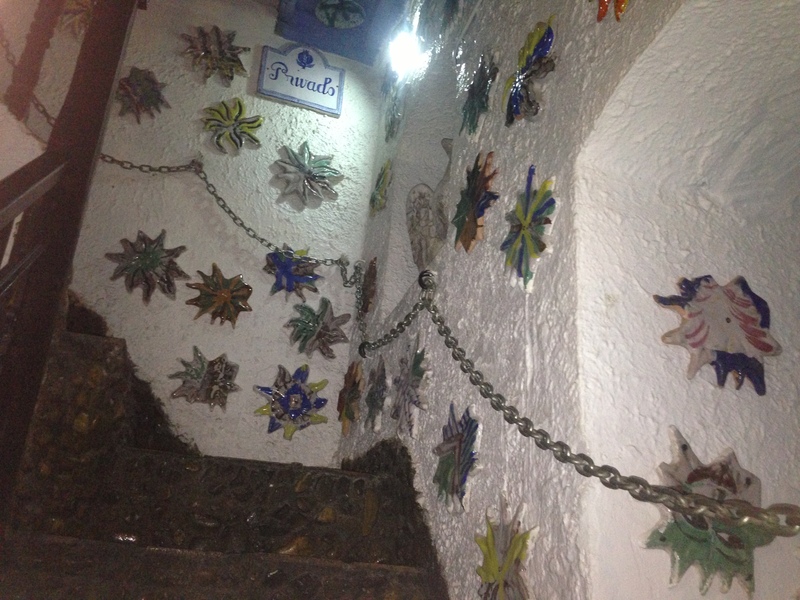 The best part of Hostal La Ninfa was a surprise. There was a great park across the street. The kids never wanted to leave and any future outing had to include a stop at the park before and after. 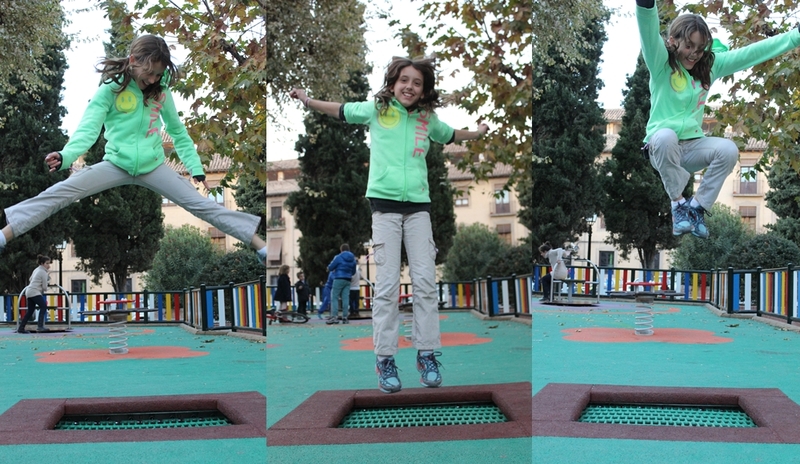 Thanks Carolina for these cool pictures! 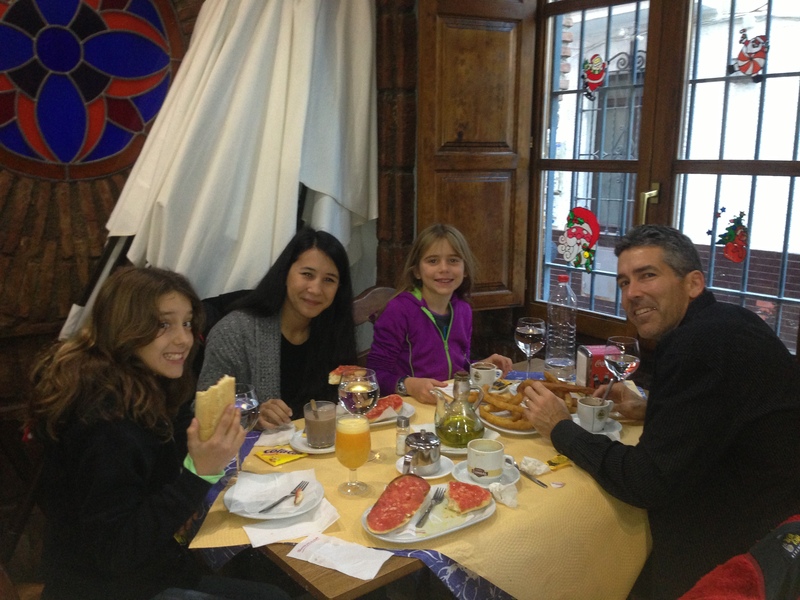 In the morning we had breakfast at a little restaurant across the plaza called El Campo del Principe. 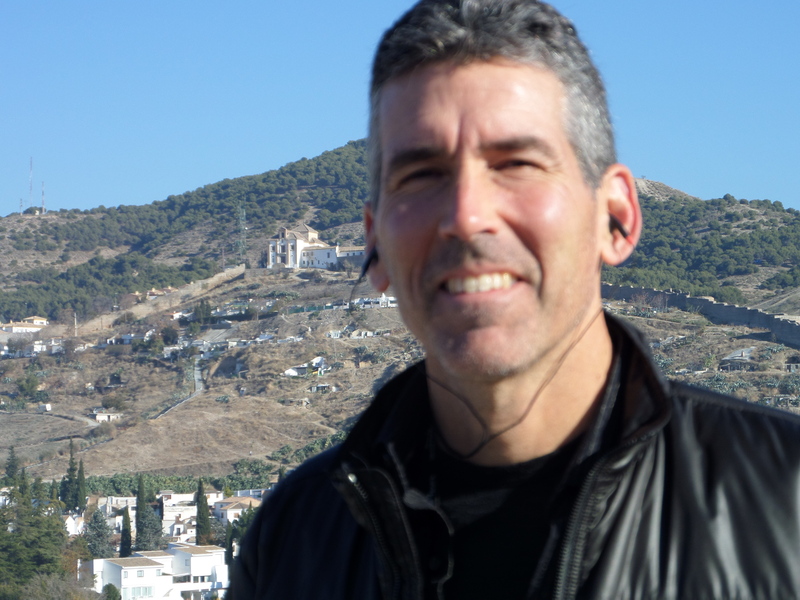 Mike, Carolina, Sky, Savvy and I hiked up a very steep hill to the Alhambra. I was thankful that the girls were fit and old enough to walk because it was not long ago that we would have been carrying them up a hill like this. 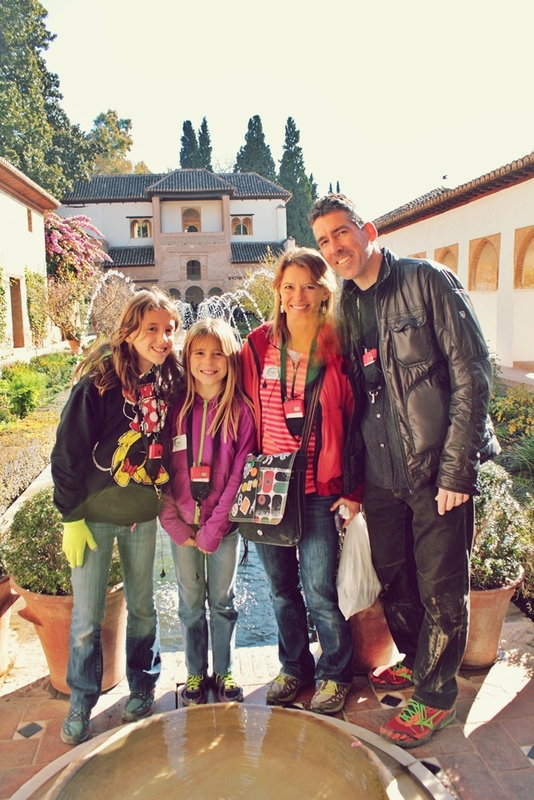 The Alhambra is considered an obligatory tourist attraction on a visit to Granada. It is the most visited tourist attraction in Spain and has more than 2 million visitors/year. It was designated a UNESCO World Heritage Site in 1984. 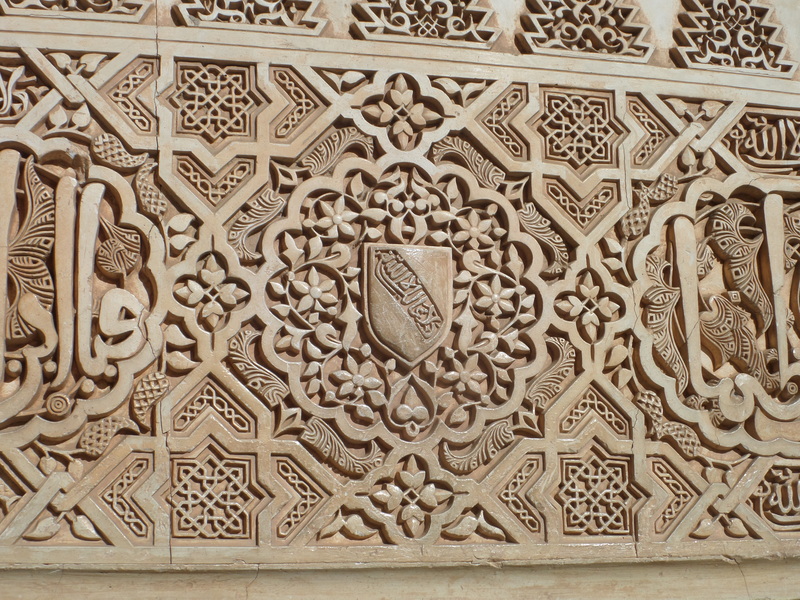 The Alhambra is one of the best preserved Arabic palaces of its time. It was finished around 1333 during the Nasrid dynasty. The Moors enjoyed a peaceful reign until 1492 when Queen Isabel I and King Ferdinand ordered an invasion. When the Catholic monarchs conquered Granada they ended 8 centuries of Arab rule in the Iberian Peninsula. After 1492 the Alhambra was used by the Christian rulers. It fell into disrepair a century later and was at times inhabited by vagrants and was even used as soldiers’ barracks during Napoleonic times. 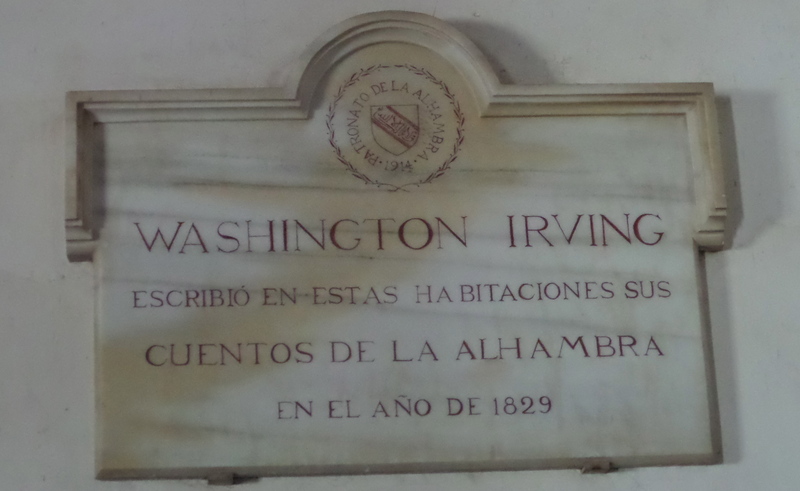 The American author, Washington Irving, who wrote The Legend of Sleepy Hollow and who is famous for his travels in Spain lived in the Alhambra. During his time in the Alhambra, he was inspired to write his book, The Tales of the Alhambra in 1829. 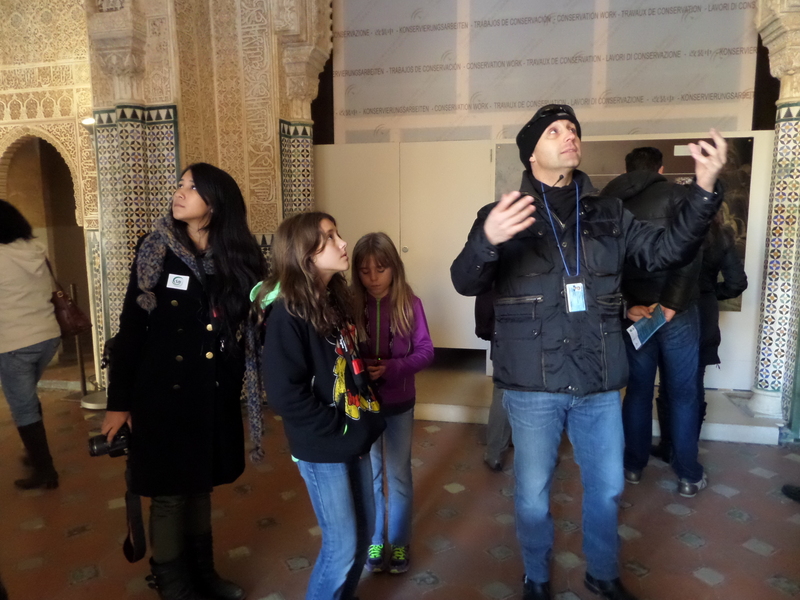 To get the most out of our visit to the Alhambra we scheduled a guided tour. We wore headphones so we could hear our guide while he walked ahead. He was very knowledgeable but seemed to be giving the tour more for his own performance than for the group’s benefit. 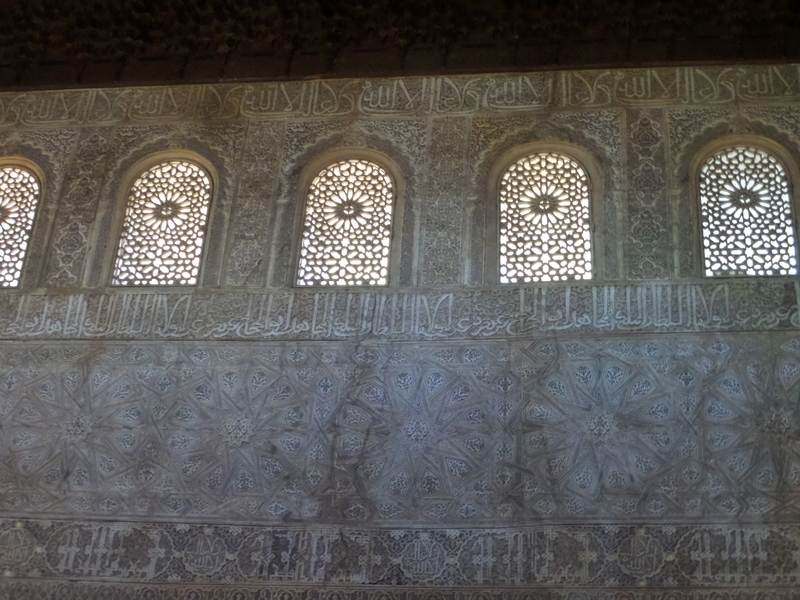 The intricate interiors of the Alhambra are amazing. Under Islamic law, no depictions of living beings (people, plants or animals) were allowed. 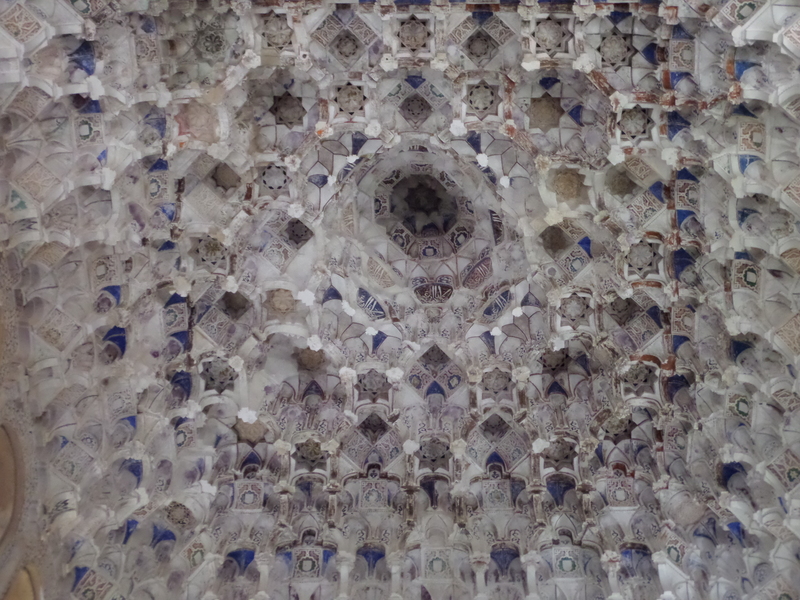 Instead, the walls and ceilings are covered with symbolic, geometrical patterns, as well as verses from the Koran. There are eight-pointed stars, representing the convergence of heaven and earth wherever one looks. 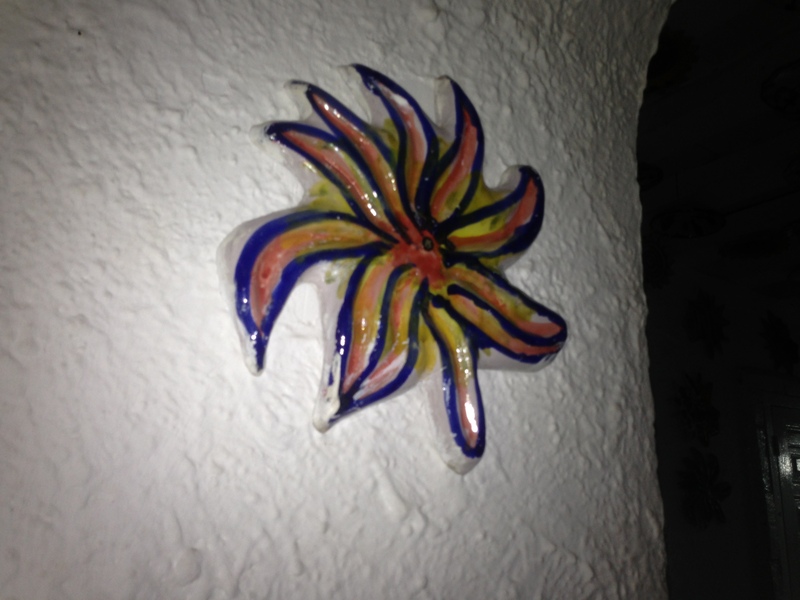 Once we learned about this, the 8 pointed stars were like “hidden Mickeys” and we found them everywhere. 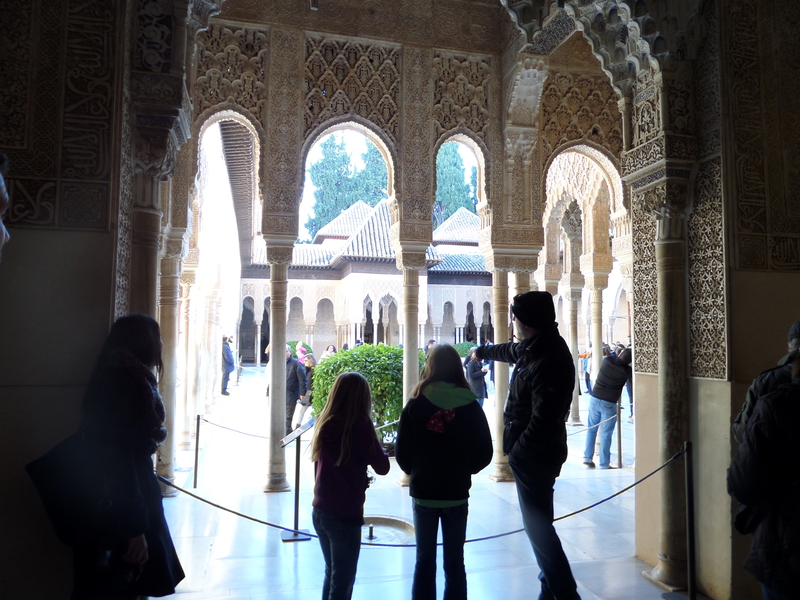 The Alhambra was built with wood, plaster and brick. Interestingly ,these materials were chosen not to last, implying humility before Allah. This was also the reason for the intentional occasional gap or irregularity in the design, since aspiring to perfection was considered blasphemous. 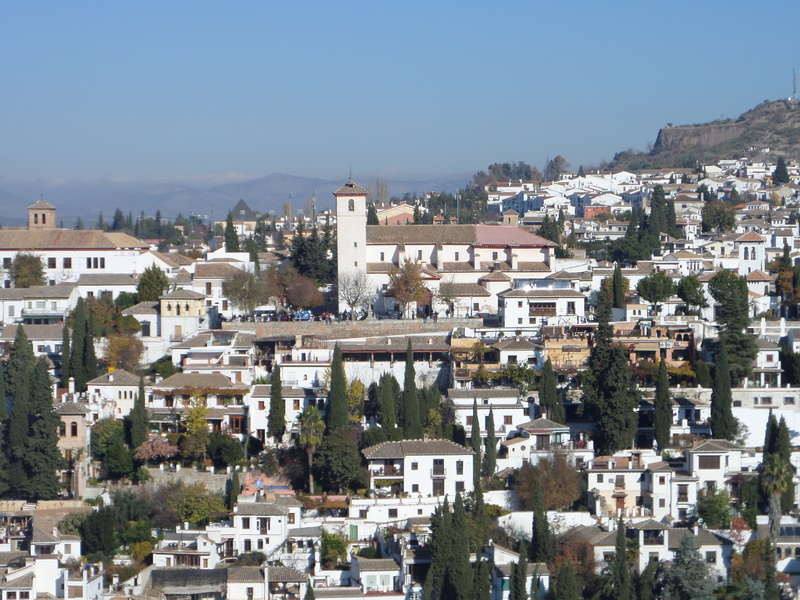 The view of Granada from the Alhambra is amazing around every turn. Within and around the palaces the gardens are endless. 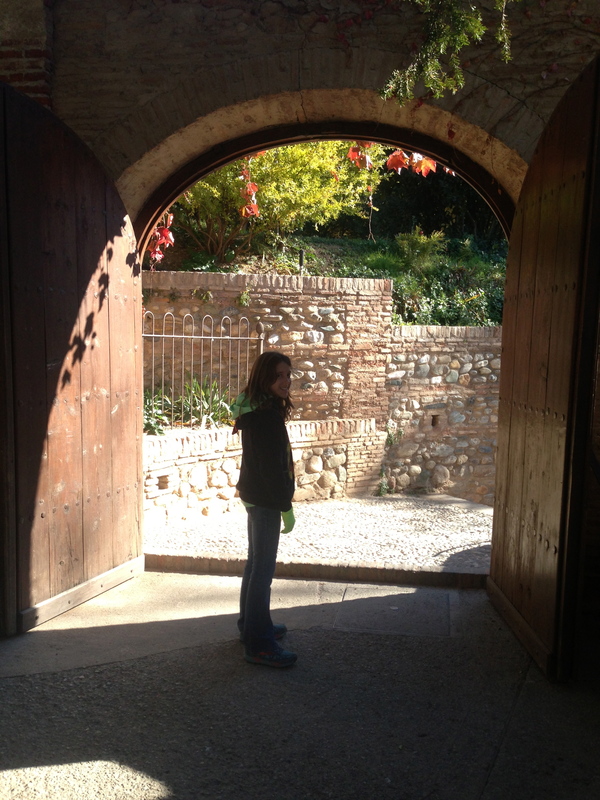 They have an amazing system of irritation that dates back to the construction of the Alhambra. 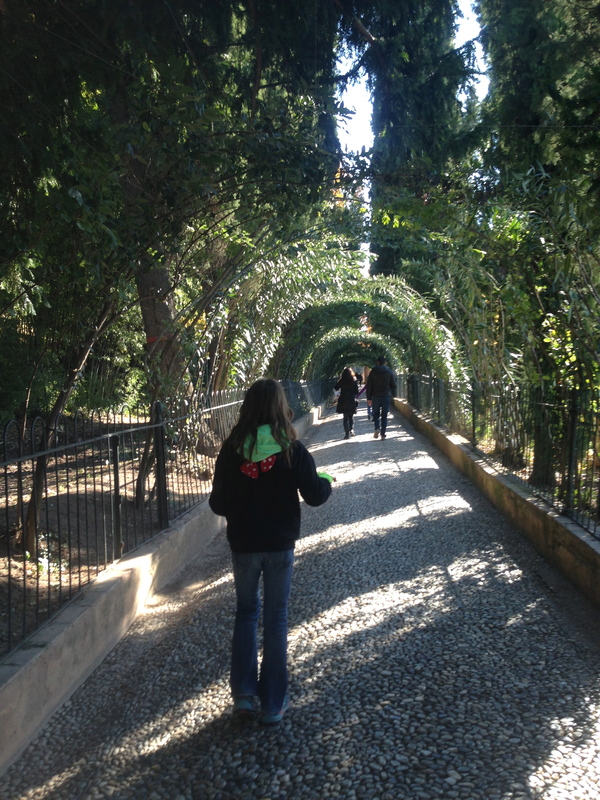 The Alhambra tour was beautiful but exhausting and by the end we were ready for a rest. We hiked back down the hill, stopped, of course, at the park… My idea of resting and Sky and Savvy’s is not the same! We had dinner at our hotel’s pizzeria restaurant across the square. 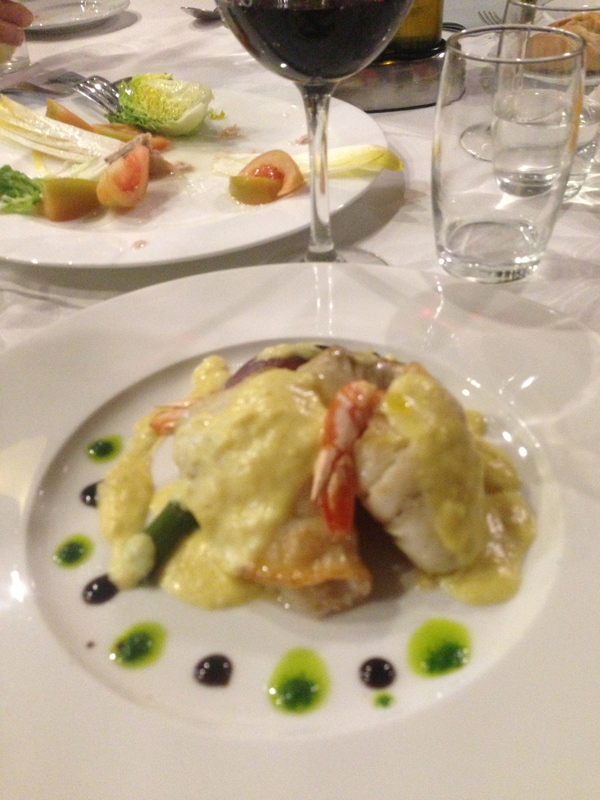 It had the same decor as the hotel which was more interesting than the food. 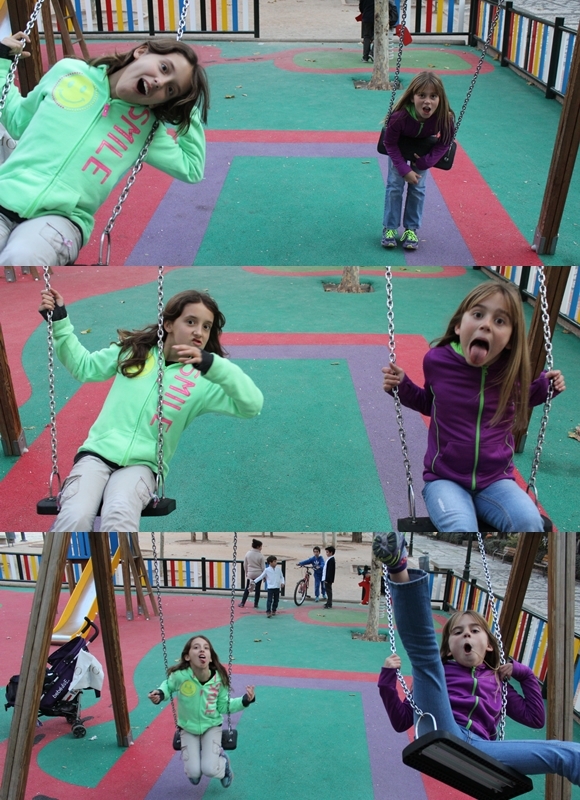 The girls had a lot of fun taking pictures. 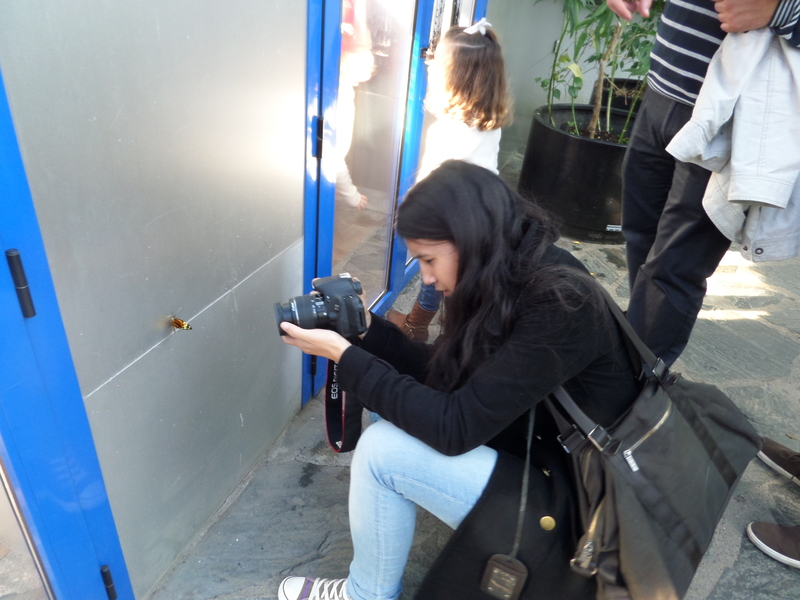 The next day we explored the Parque de las Ciencias which was highly recommended for children. 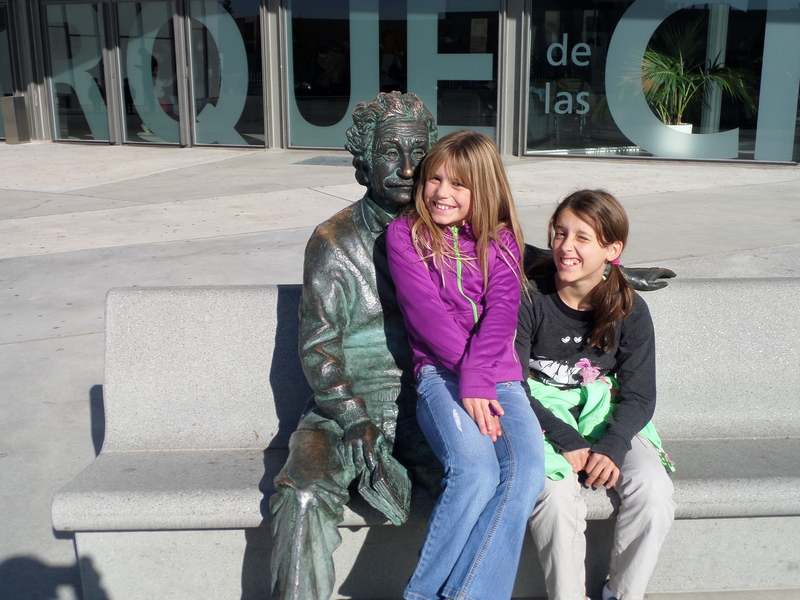 Einstein was sitting out front so we paused to pose for a picture with him. The Parque de las Ciencias is huge. Our favorite section was el viaje del cuerpo humano (the voyage through the human body) which included really cool stuff like a video of a live human birth. Very cool for kids to see a birth. Sky decided to skip it. There were exhibits of other animals as well. Savannah really liked the preserved hearts. 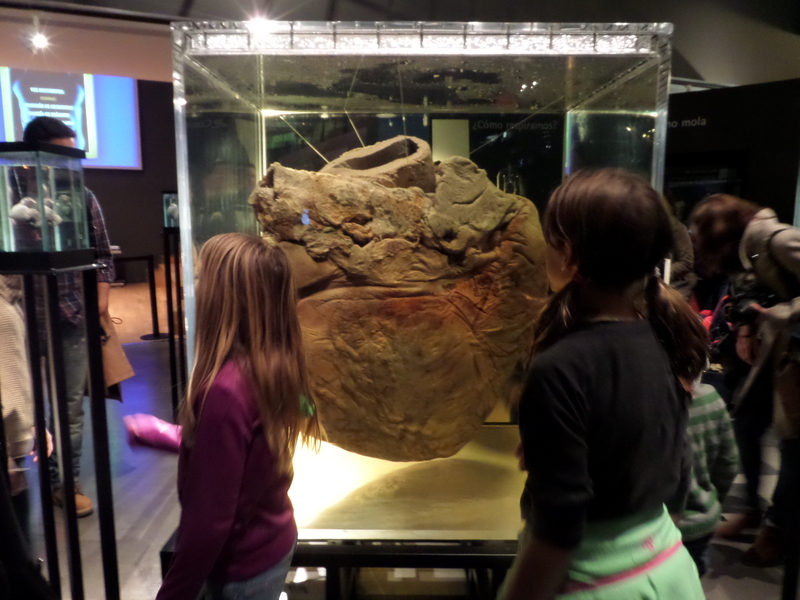 There was a preserved whale heart next to a tiny human heart. I especially liked the exhibit of the smoker lung compared to the healthy lung. Outside there was a mariposario (butterfly house) which was a bit of a disappointment compared to the butterfly park that we visited in Benalmádena near Malaga. 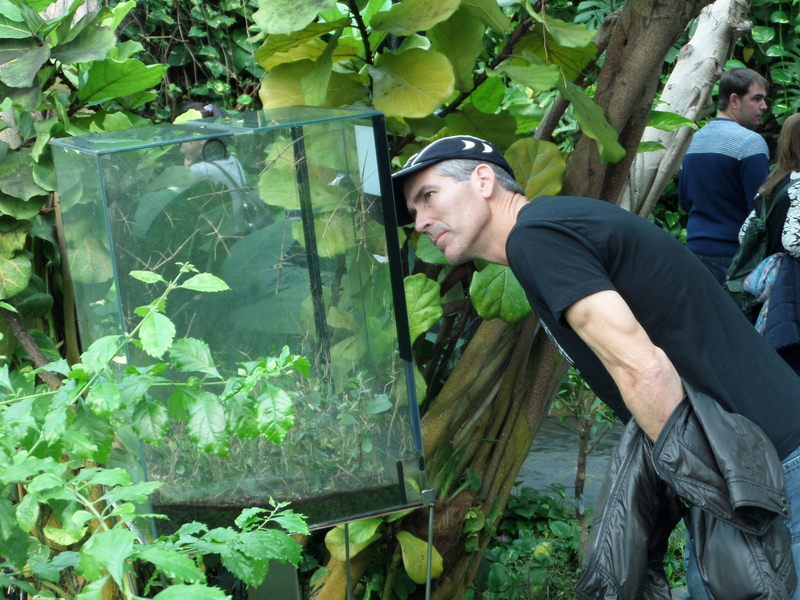 However, we love all butterfly parks so it was a mandatory stop for us. 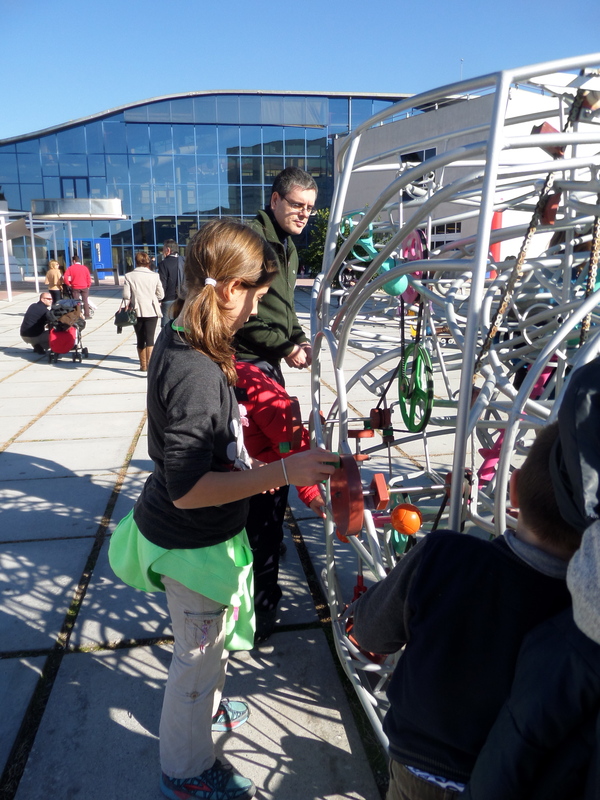 There were outside gardens, a giant chess board, Marie Curie, and lots of activities for the kids. We spent the entire day there and only saw a fraction of the place. 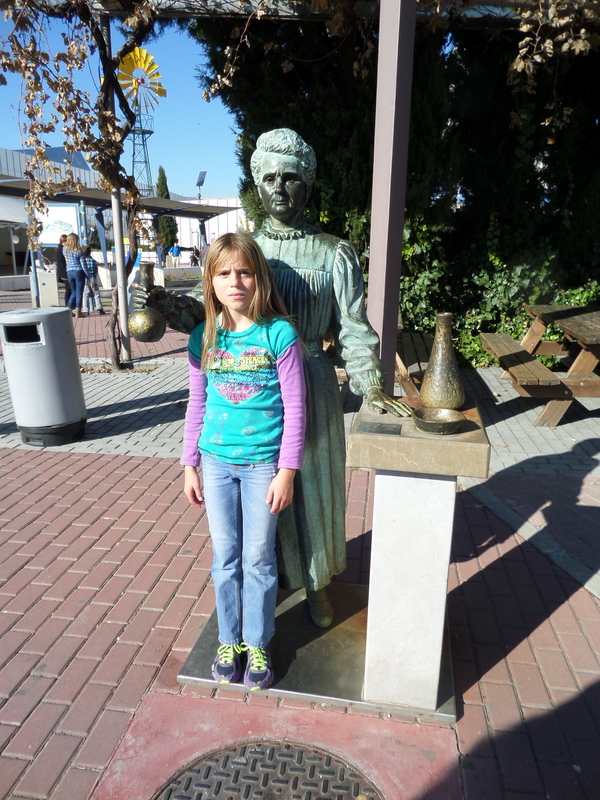 Savvy, not thrilled to be posing with one the most famous female scientists of all time. 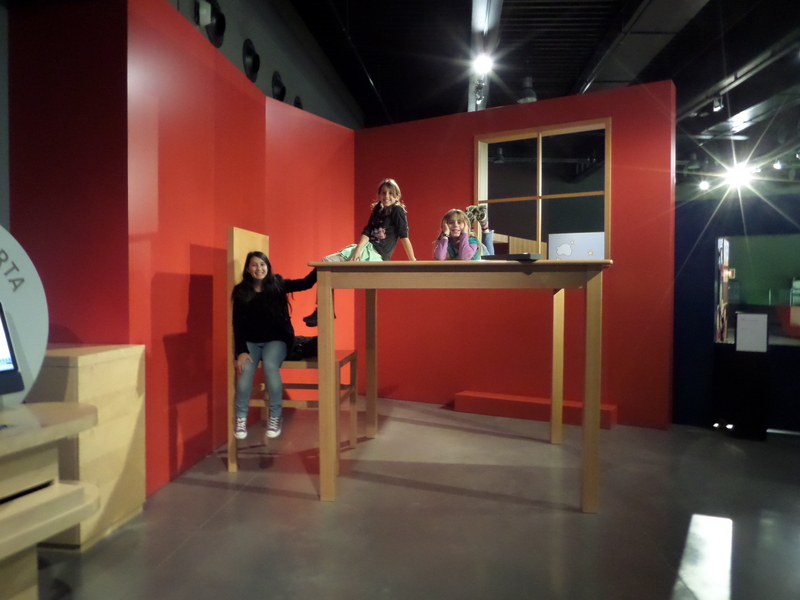 In this exhibit everyone felt small. 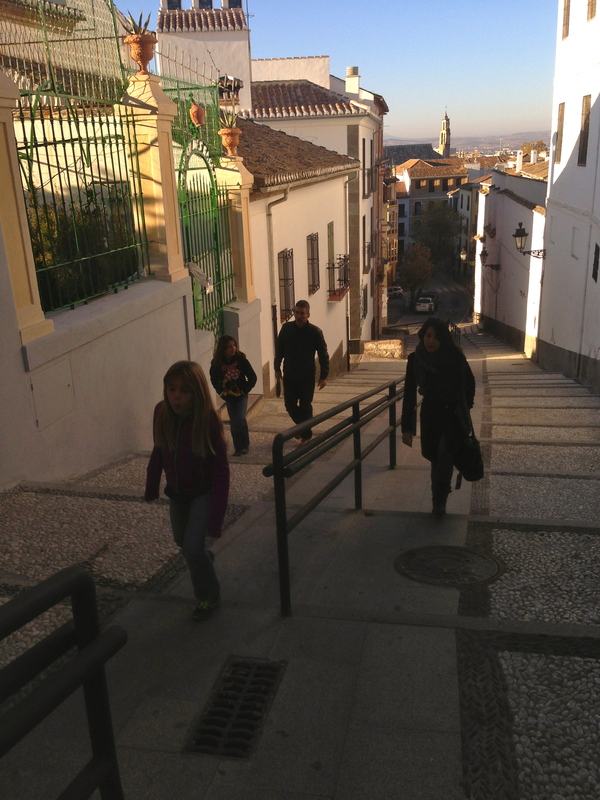 We explored Granada on our way back to the hotel. We were hungry so I checked Trip Advisor and found a recommended Mexican restaurant. 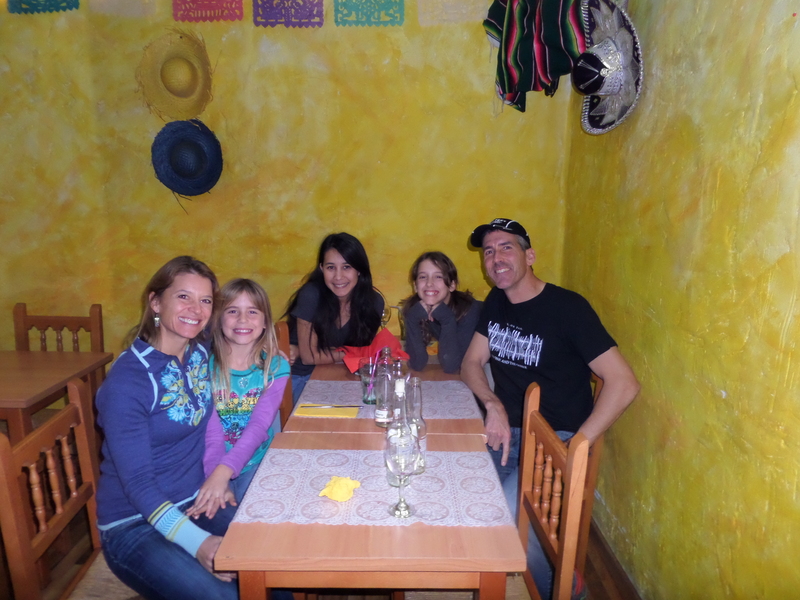 Team Kezmoh and Carolina love Mexican food! Leslie, Savvy, Carolina, Sky and Mike waiting for our burritos. Does the wall look familiar to anyone? Love it! 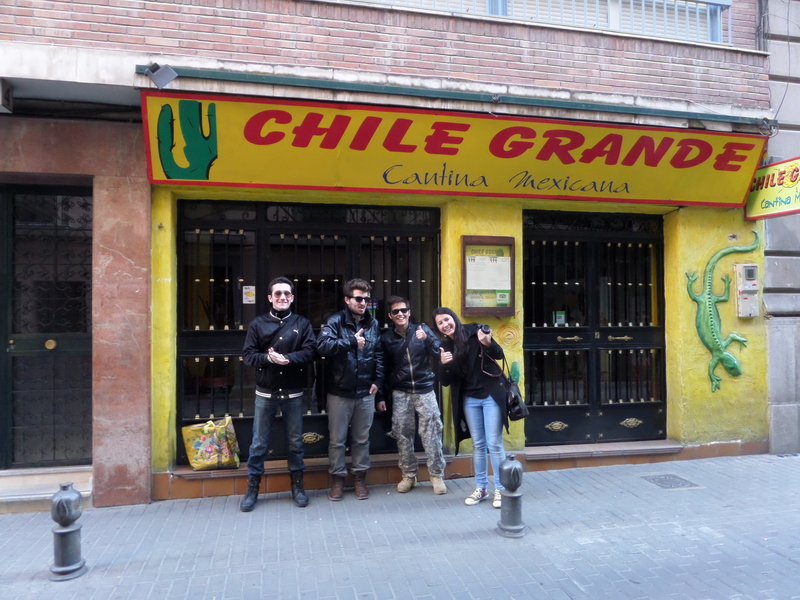 We found Chile Grande Cantina Mexicana, a little bit of Mexico in the heart of Granada and we were not disappointed. We had Coronas with lime, chips, guacamole and burritos. 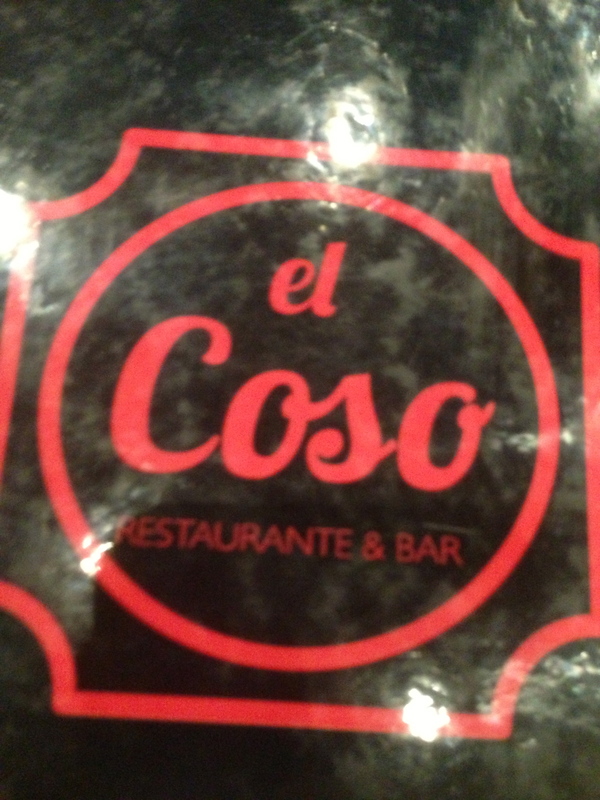 We stayed until they closed for their break before dinner (which in Spain starts at 8pm). Carolina posed with the cool waitstaff on their way home outside. 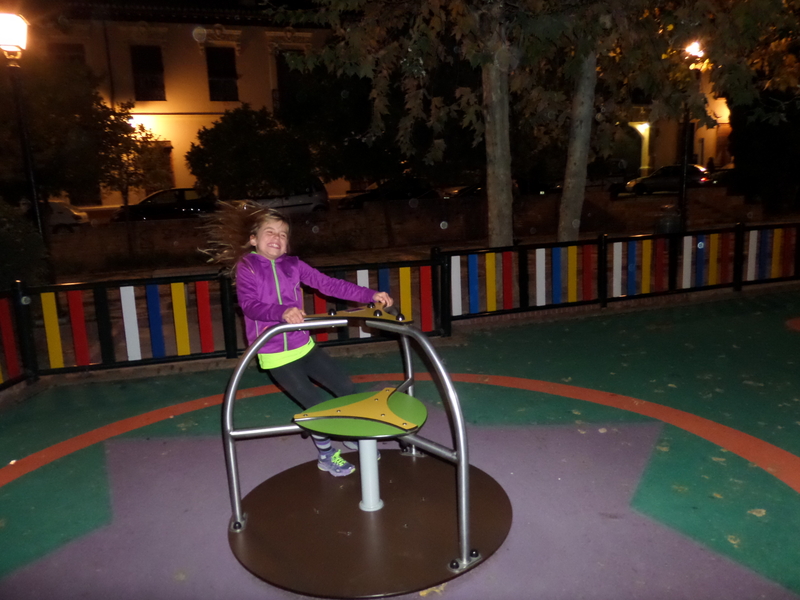 We passed the rest of the evening playing at the park outside of the hotel. 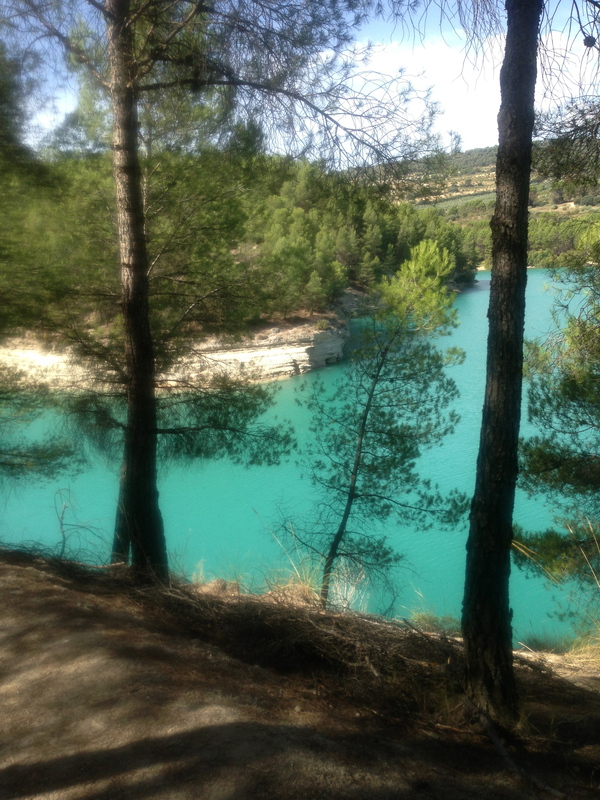 In the morning we headed back to Alhama de Granada. 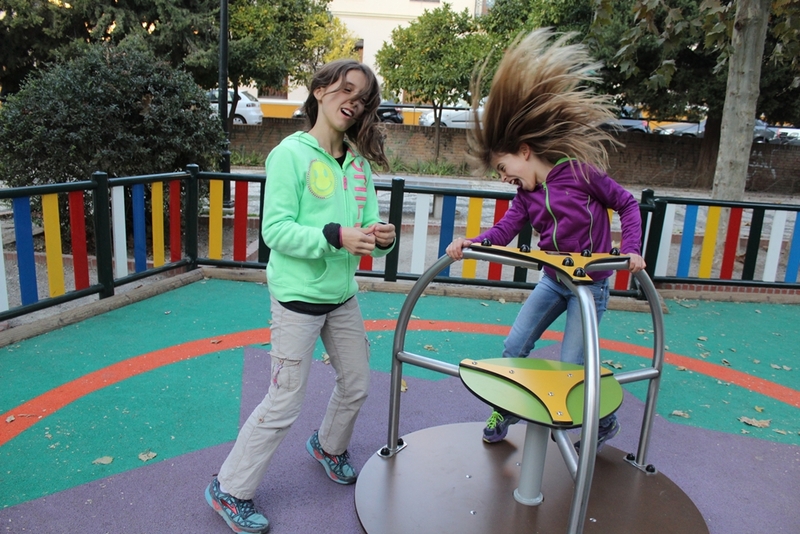 Spinning round and round and round with crazy hair!!!!! 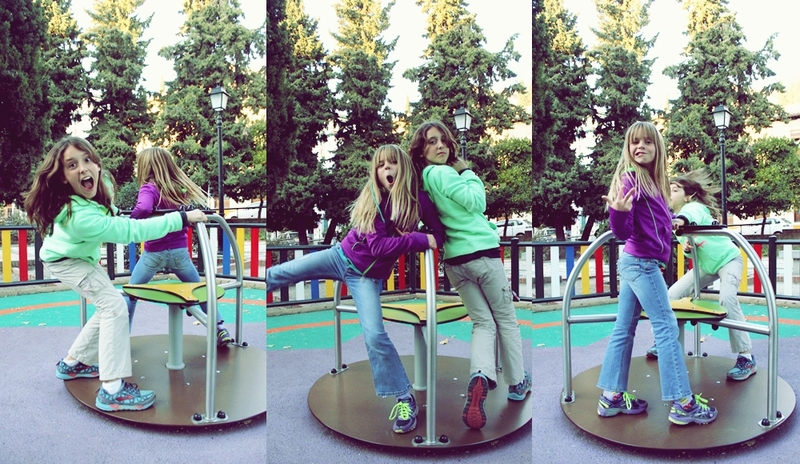 Silly girls on the swings. It was a full weekend! 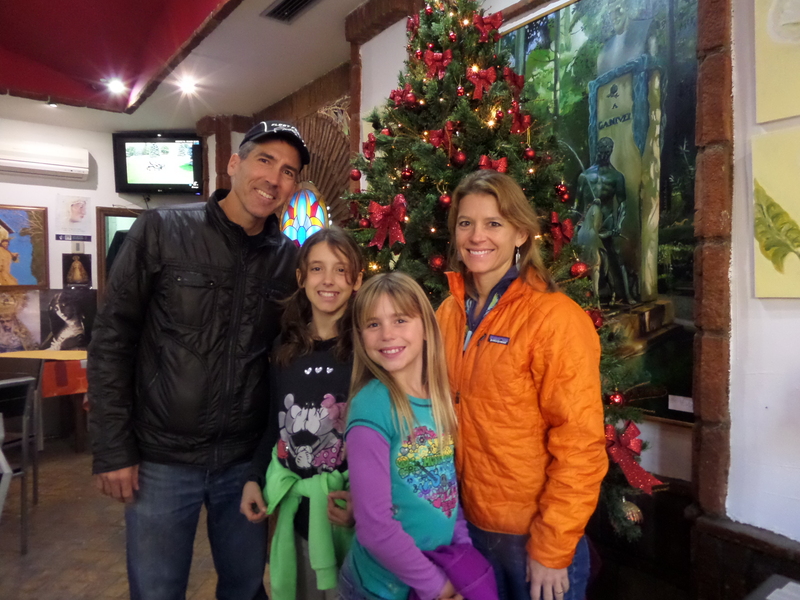 Luckily Carolina stayed for the rest of the week so the girls were able to give her a tour of our pueblo. 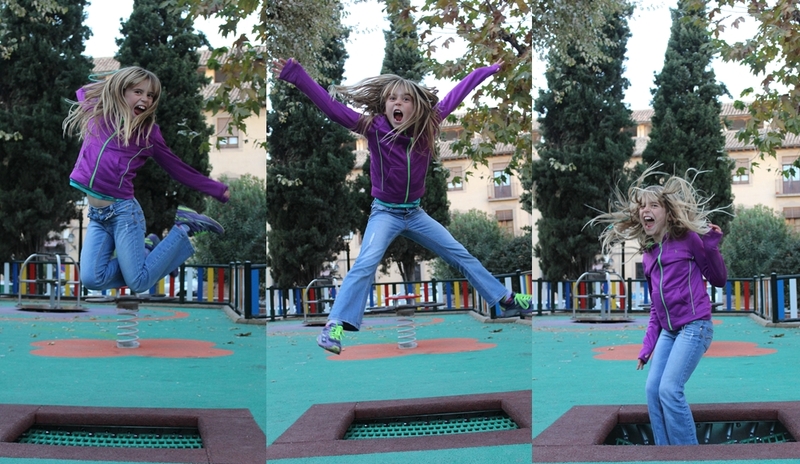 She stayed with them while we had our adventure to Nerja (see previous post). 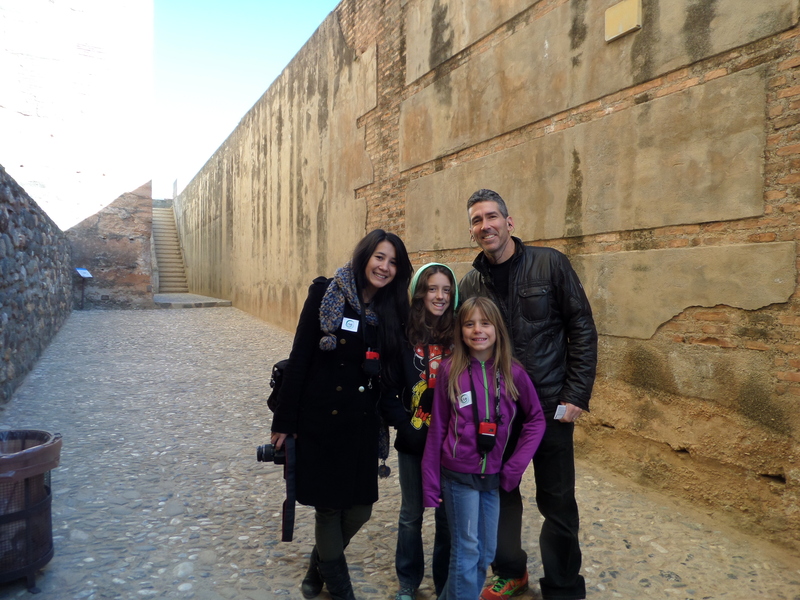 If anyone has questions about visiting Granada with kids feel free to send me a comment. By the time I send this I will have been back several times. We are a family planning a trip to Spain this year. So glad to see you are all having a great time in Espana! The Alhambra is very beautiful and you can literally feel the history there. 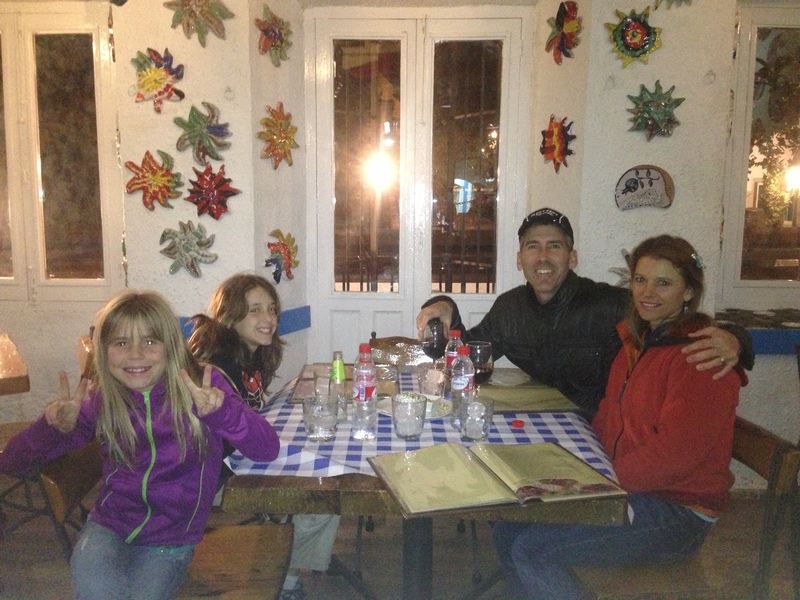 So glad to see you are all having a blast in Espana! 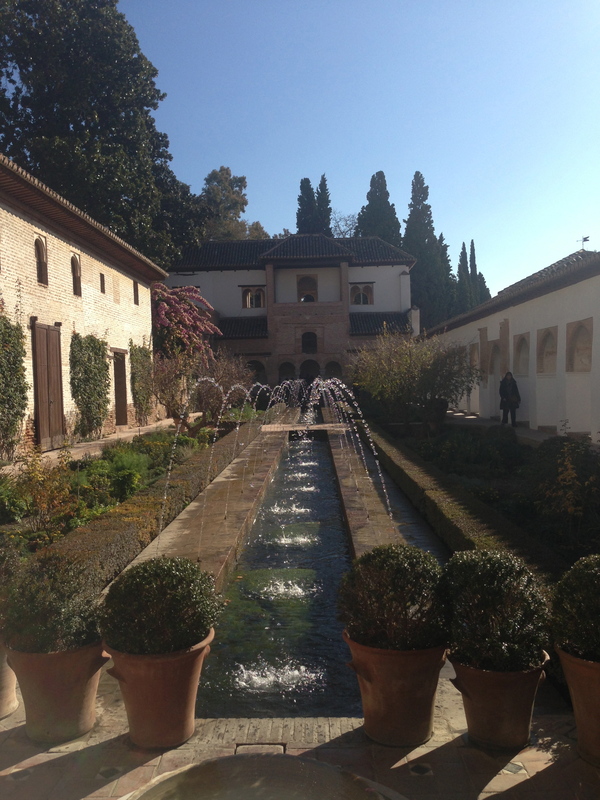 The Alhambra is beautiful and you can literally feel the sense of history there. Gracias Davine. I know that you love Espana too! I hope all is well with you!